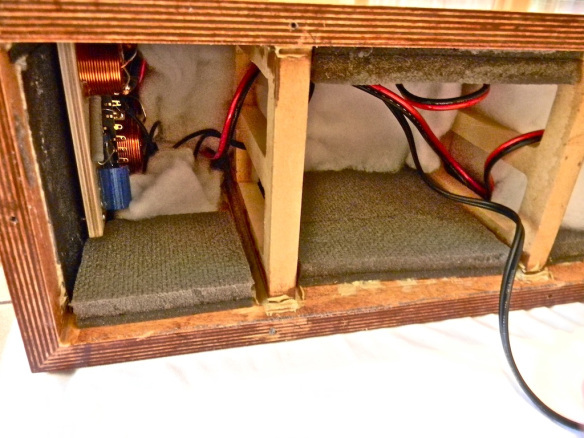 Here finally are pictures and a writeup of the CNO-T25 center channel speaker that I built for listening to music in 3 channel stereo. 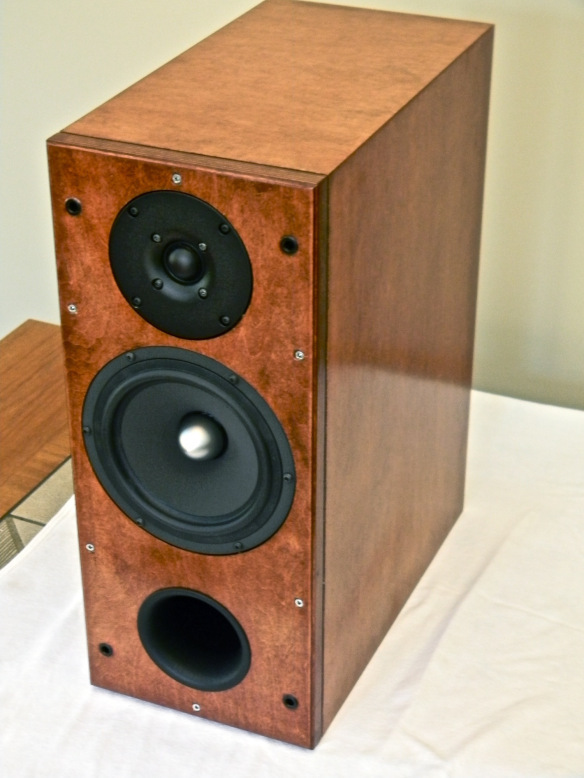 Because of shipping costs, paying a professional cabinetmaker to make the cabinet, and the need to buy supplies that have minimum quantities sufficient for more than two speakers (a complete 4' X 8' sheet of plywood, stain, clearcoat, damping, etc. ), the speaker was not so inexpensive (probably close to $900 USD). I am however absolutely delighted with how it turned out. 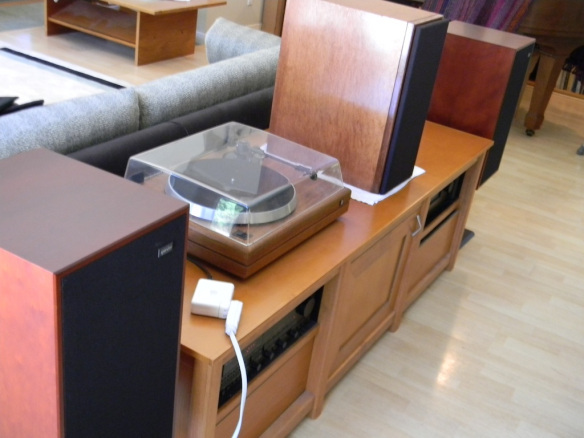 I am so pleased with the sound and your thorough documentation and email support that I am now planning to build your latest design, a pair of the Seas Curv minispeakers. Thank you for so generously sharing your wonderful designs with the DIY community! I built a “monitor” stand/shelf style speaker 19″ (h) X 8″ (w) X 15″ (d). This gives a net interior volume of about 24 litres. The port is mounted on the front. The walls are 3/4″ Appleply (http://www.appleply.com/) hardwood plywood, the front baffle is laminated with 3/4″ mdf to be 1+1/2″, and is removable via 6 screws. I added a wood frame fabric grill to hide the drivers. The cabinet was beautifully executed with mitred joints by Kirk Cortopassi of Kirk’s Cabinets in Los Banos, California. I stained the cabinet and it was brush clearcoated with polyurethane. 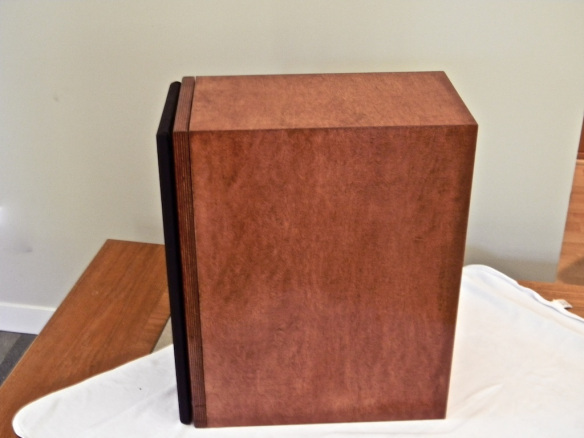 The staining is a bit amateurish, the speaker though has an organic/natural appearance that works well in my house. 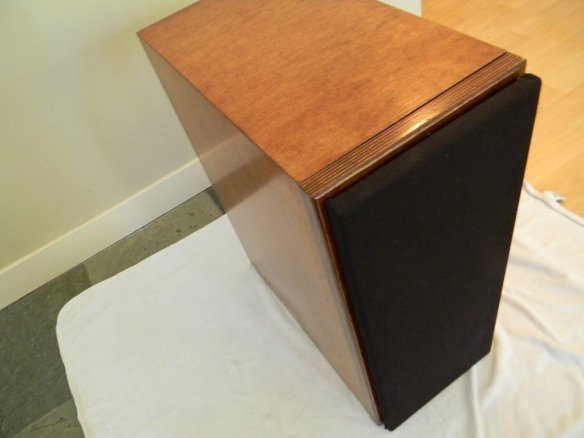 The MDF portion of the front baffle is not visible and fits just inside the main speaker box. 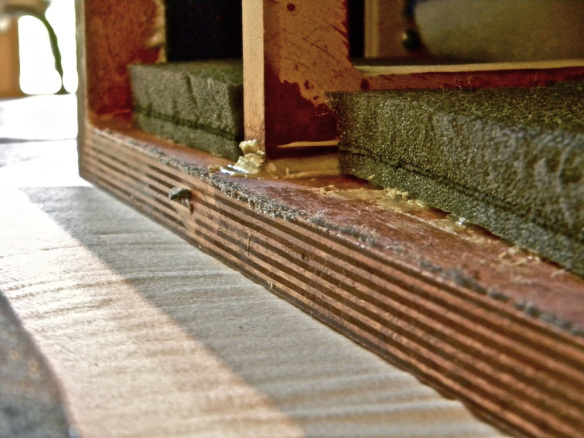 Therefore the MDF portion is 3/4″ less in length/width than the outer plywood portion. 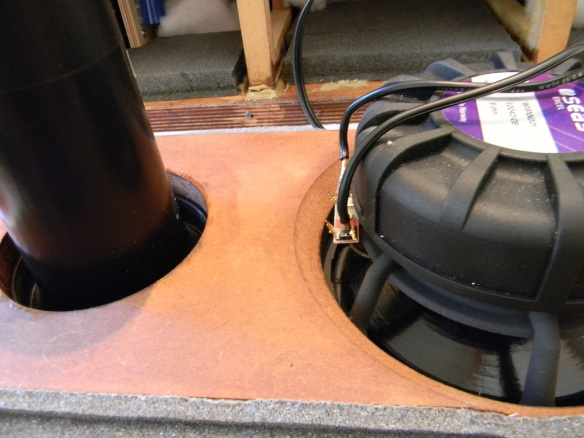 In the photo below you can see the grey foam tape on the edges of MDF portion of the baffle and the back lip of the plywood portion of the baffle; the backside of the woofer hole was chamfered to improve airflow. 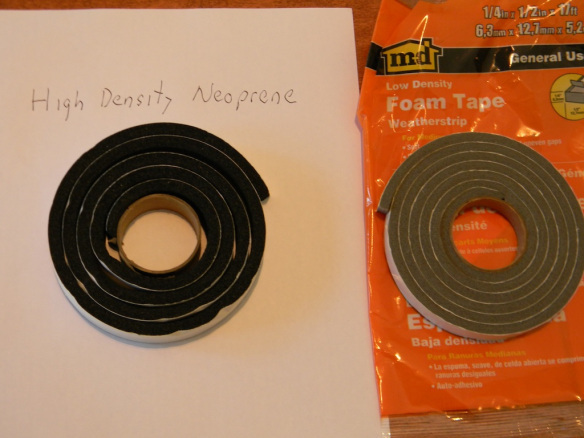 I used low density foam weatherstripping around the inner portion of the front baffle, and I used high density neoprene as a gasket to seal the drivers to the front of the baffle. I hoped that by using this weatherstripping I might reduce some of the vibration transmitted by the drivers to the baffle, and the vibration of the baffle to the cabinet. I don't know if it really helped, but I am happy with the result. The edges of the front baffle were all rounded over with a router. The fabric grill has a wood frame with all internal edges rounded. Below are side and front views with the grill. Thanks again for the design and support.